Rachel Wooley, MA Curating Collections and Heritage, outlines important information acquired at a conservation session at Brighton Museum. 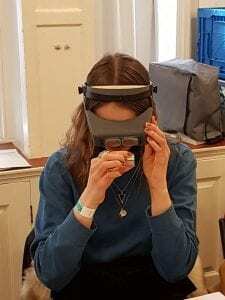 MA History of Design and Material Culture student Elina Ivanov inspecting a bug specimen through magnifying head gear. Brighton Museum & Art Gallery. Photograph by Helen Mears, 5 March 2019. 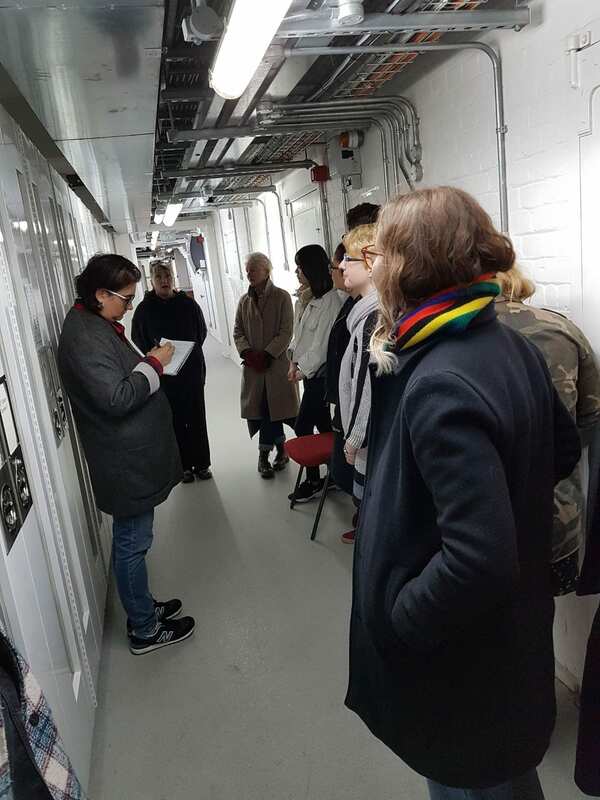 As one of a group of (very keen) students on the MA Curating Collections and Heritage degree, I am currently taking a module entitled ‘Caring for Collections and Their Users’. 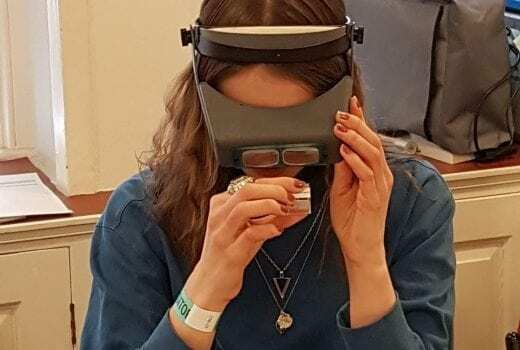 In order to learn how to exercise best practice in preventative conservation (and therefore ‘Care for Collections’), we visited Gaye Conley, the Conservation Manager at Brighton Museum, in March 2019. She gave us a comprehensive guide to the Eight Agents of Deterioration, through which I will briskly but gracefully guide you. Physical forces can include general wear and tear, continued use and excessive or negligent handling. Gaye informed us that even experts in the museum sector can damage objects because they trip on a power lead or forget to lift an object from its base. Museums also engage in extensive documentation, which covers every movement of every object, so that (in theory) a member of staff can locate any object at any time. Concerning fire, don’t start one. If something is on fire, put it out as quickly as possible. Leaks, mould, and flooding are unfortunately very common in museum storerooms and even exhibition spaces. Museums are often not fit for purpose, and with museum funding at an all-time low, patching up a roof or building a storeroom that isn’t in the basement isn’t always a possibility. 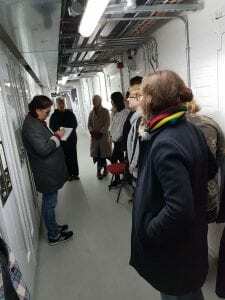 Gaye Conley explaining the issues of having a storeroom in the basement. Brighton Museum & Art Gallery. Photograph by Helen Mears. 5 March 2019. There are four different types of pests (general pests, wood borers, keratin pests and cellulose pests). Each type has a different food source. There are three different types of commonly used traps (blunder traps, sticky traps and pheromone lures, which only attract male pests). If you have a pest problem, this means there’s a food source nearby. If you have loads of wood boring insects such as, for example, the Death Watch Beetle, that means they’re feeding on some wood. If you have mice, they’re probably eating human food. The practice of catching pests (particularly insects) is to give you some indication of how bad your pest problem is, and what you need to do about it. The goal of catching them is not primarily to kill them (although, if you catch a lot of White Shouldered House Moths next to your prize Hawaiian ceremonial cloak, you may then decide to freeze it or use an insecticide, which would obviously result in the moths’ untimely demise). Pollutants can be anything from dust and sea salt to traffic pollution and pollen. Dust is a particular issue for museums. If it settles on an object for long enough, it can bond with the surface and cause permanent damage. It can also encourage some pests (the ones that want to eat dead skin). Direct sunlight is damaging to objects, just as it is to your skin. Keeping objects away from windows is a good idea, but not always possible. Many heritage institutions have opted to put UV film on their windows, or block all of their windows out and instead use LED lights, which put out almost no heat and UV rays. Finally, according to Gaye, temperature is less important than humidity. The ideal humidity is between 40 and 60RH (relative humidity). This has the power to completely halt the reproduction of certain pests, or even kill them, if the conditions are perfect. Overall, the session was a hugely informative one, with a central focus on IPM (Integrated Pest Management). The highlight was inspecting bug ‘specimens’ captured in glass containers. It was also enormously helpful to witness preventative conservation techniques in practice within a museum, to put what we’d learned into a physical setting. Huge thanks to Gaye for welcoming us into the museum and for hosting such an informative session.